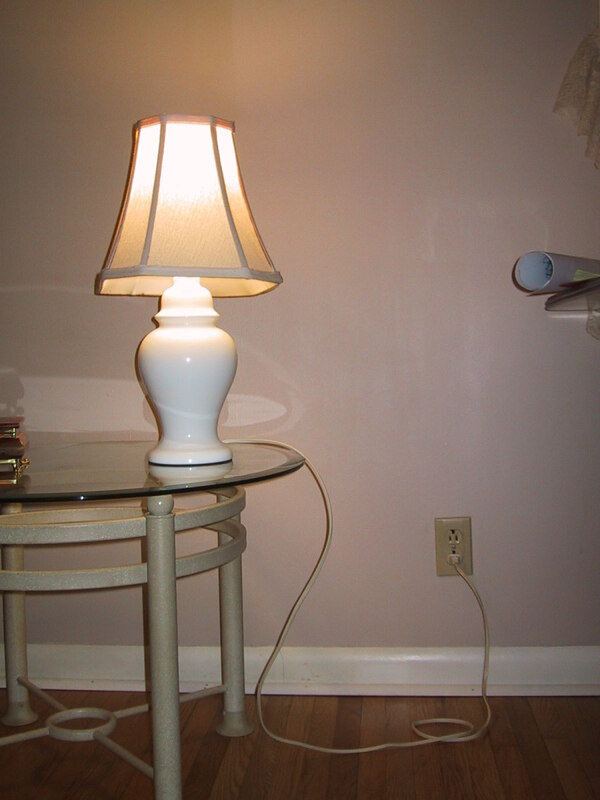 Adding outlets in your home isn't particularly difficult. It just takes a little effort and basic knowledge of how to add that outlet. The electrical end of the task is very simple; it is running the wire that is the difficult part of the job. Your effort here can pay off handsomely, as the cost for a new outlet can drop from hundreds of dollars to around fifty plus your work and time. Access to either the attic or crawl space is necessary unless the sheetrock or other wall covering is to be removed. Most homes will have one or the other available, but in rare cases, the only possibility will be to remove the sheetrock and replace it. There are several things to be considered with the outlet addition, beginning with a source of power for it. It is always possible to add a new breaker to the breaker panel and install a whole new dedicated circuit, but this is not something most homeowners should be looking at; it requires the services of a professional electrician. 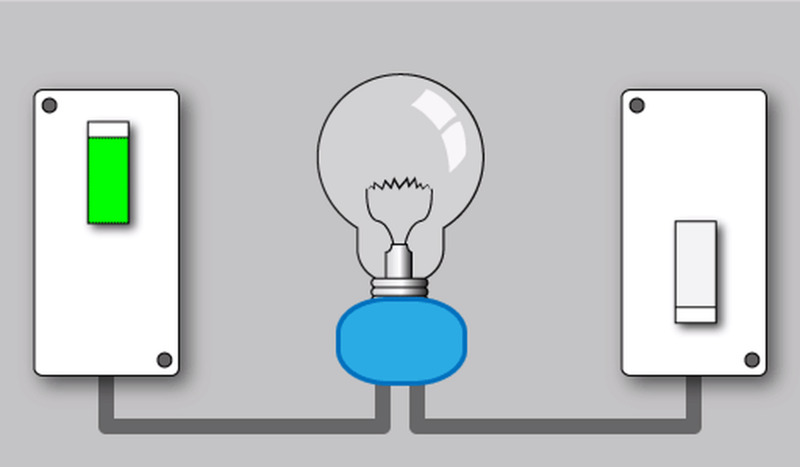 Much simpler is to get the power from an outlet on an existing circuit. A nearby outlet must be located to run the wire from, but not all outlets are created equal in this regard. Highest on the list of possibilities will be an outlet on the opposite side of the same wall, especially if the new outlet can be located in the same stud bay. You won't want to place the new outlet exactly behind the existing one, but a few inches away in the same stud space will make the job enormously easier; you won't have to enter the attic or crawl space at all and will need only three or four feet of wire. The outlet installed in this closet turned tool storage was of this variety and took less than ½ hour to accomplish while adding a light fixture above the outlet at the same time. Next on the list is an existing outlet in the same wall, or nearby in a different interior wall. The distance won't affect the work much at all, and only increases the cost a little bit, but keeping it in an interior wall means that you won't have to get wire through the insulation on an outside wall. While that is possible it is often quite difficult, and reaching an outside wall in either the attic or basement is difficult at best. Finally, an existing outlet on an exterior can usually be used if that is all that is available. Unless you can do the work from a crawl space or basement, though, do not choose an existing outlet that is under a window. You will not be able to get wire to the attic. The only other consideration here is to not use a kitchen or bathroom outlet to get power from. These outlets are very often loaded to near their maximum current draw and anything more will trip the breaker. Plumbing or ductwork already in the wall can cause problems as well when you begin to "fish" wire. Stay away from these outlets if at all possible. With the outlet chosen, find the breaker that turns it off. It will be labeled with either a "15" (for 15 amps) or "20" (for 20 amps). 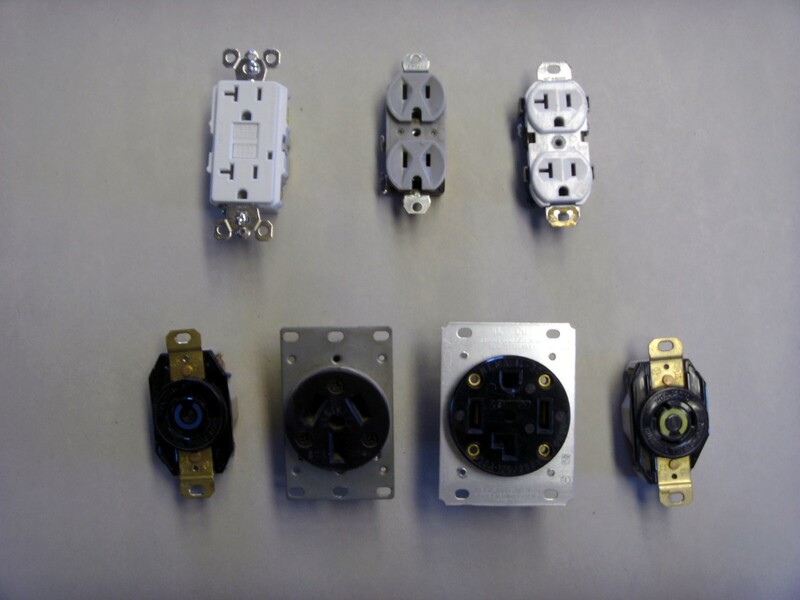 This will determine the wire size and type of outlet you will need to purchase. Wire. If the breaker located in the preceding section was a 20 amp breaker you will need 12 gauge NMC (Romex); if the breaker was a 15 amp either 12 gauge or 14 gauge is fine. 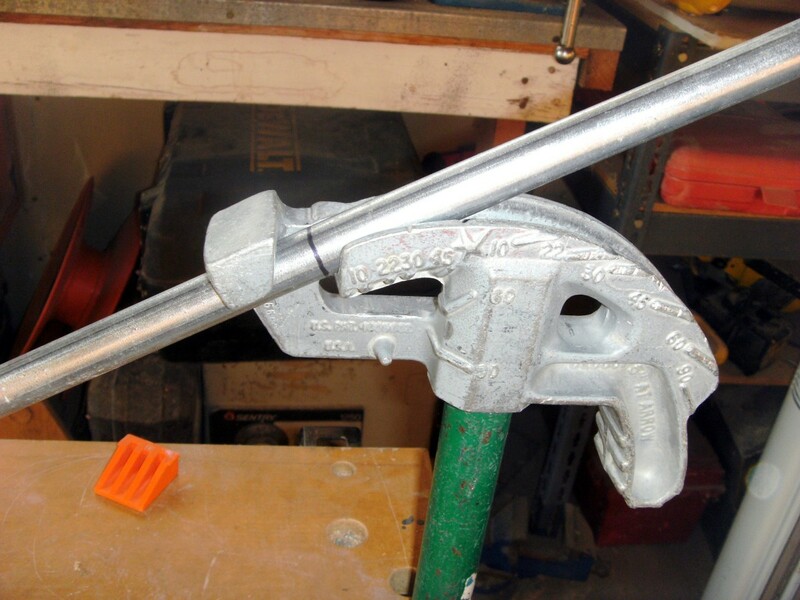 14 gauge is smaller and easier to use as well as being cheaper. Either size requires 2 wires (plus ground) per cable and will be listed as 12/2 or 14/2. You will be running wire up to the attic (or down to the crawl space), across the ceiling or floor joists and back down (or up) to the new outlet. Measure the distance and add at least 10 feet to the measurement for a total length of wire needed. New outlet. Make sure that the ampacity of the new outlet is the same as the old one. While it is permissible to install a 15 amp outlet on a 20 amp breaker, you should never put a 20 amp outlet on a 15 amp circuit. A new cover plate is needed for the new outlet as well. 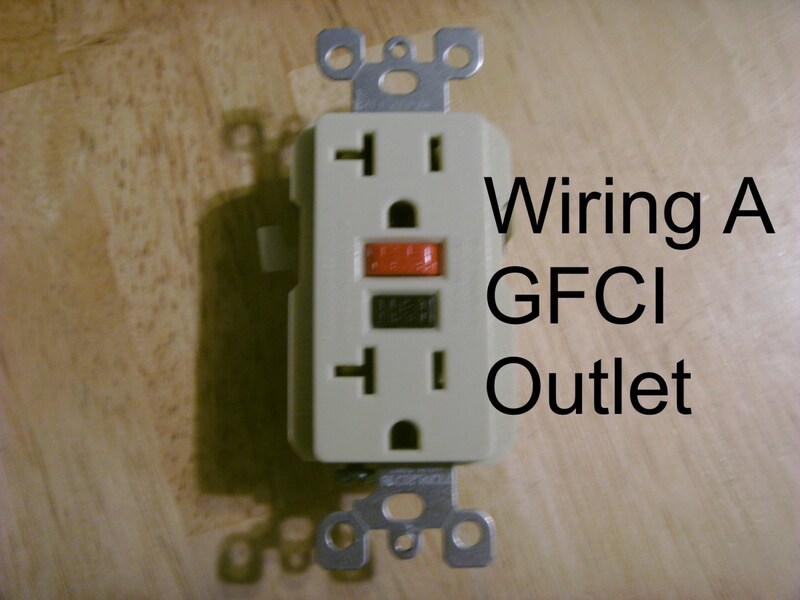 If it is in a garage a GFCI type is required. New wall box(es). You will need a single gang (one outlet) plastic "old work" or "cut in" box (same box, just different terminology). 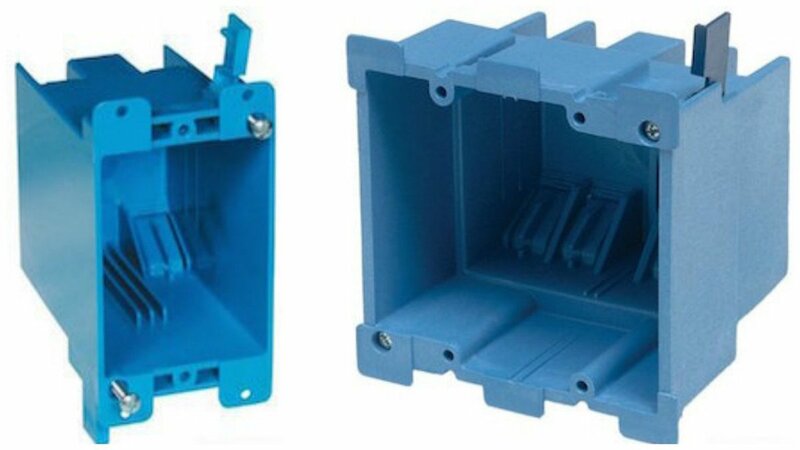 In addition, if the existing outlet being used for a source of power is not in the same stud bay you will need a second one as that existing box will be removed. In the Amazon picture to the right, the small plastic piece sticking straight up is folded down against the box for insertion into the wall; turning the screw pops it back up and pulls it forward to squeeze the wall and hold the box in place. There is one on top and bottom. Wire Staples. You need to support the new wire every 4½' whenever possible; staples are cheap so make sure you have plenty. Wire nuts. You will want to have a half dozen or so wire nuts on hand, of a size suitable for the wire size used. A drill with both a small (around 1/8") bit and a larger bit of around 5/8" or 3/4" size. Spade bits work well for the larger size. Both phillips and a straight bit screwdriver. Jab saw, or some other method of cutting sheetrock. A "box cutter" or "razor knife" will work, but it takes more time and effort. Wire strippers. Most will also cut wire, but if not wire cutters will be necessary. If you will be pulling wire through an insulated wall, a long (8' or more) stiff wire will be invaluable. Home improvement stores often carry wire to support suspended T grid ceilings; these are perfect. Electrical tape. If the stiff wire above is used to "fish" the electrical wire through a wall electrical tape makes a good way to fasten the stiff wire to the electrical wire temporarily as it is pulled through the wall. I can't emphasize enough the need for safety when doing electrical work. 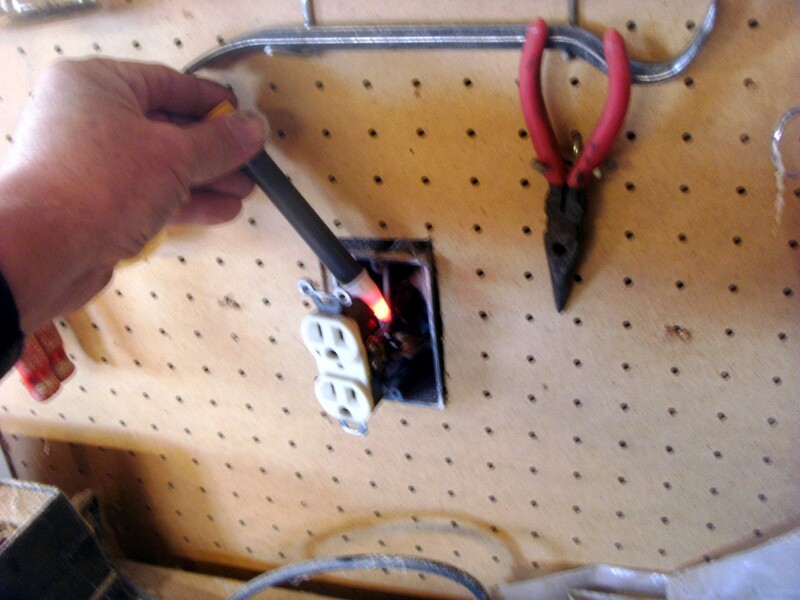 Safety is always something to be concerned with, but when doing electrical tasks, it is a necessity. Getting a nasty shock probably won't kill you, but it certainly won't make the job any more pleasant, either. 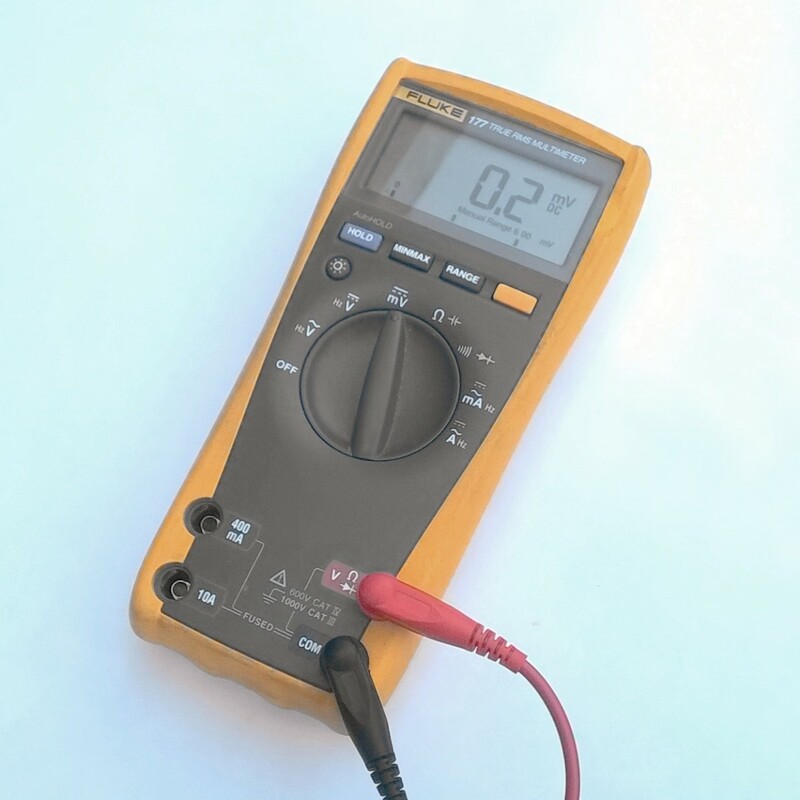 This non-contact voltage tester is the one this professional carries at all times and uses constantly. I highly recommend it for anyone doing any kind of electrical work. Locate the area for the new outlet, making sure it is not directly opposite (through the wall) from an existing one. Matching the center height of other nearby outlets, hold the new box to the wall with the opening away from the wall and draw a line around it as a cutting guide. It would be wise to locate the studs in the wall so that the hole for the box doesn't end up over a stud; if it does, the hole will have to be patched and a location a few inches away chosen. Unless you are planning to run new wire through the crawl space do not locate it under a window—you can't reach the attic that way. Cut the hole. Remember, if the hole is a little small it can be made larger, but a hole that is too large and that lets the box fall into the wall will have to be patched and a second hole cut. Cut on the small side and enlarge the opening as needed. 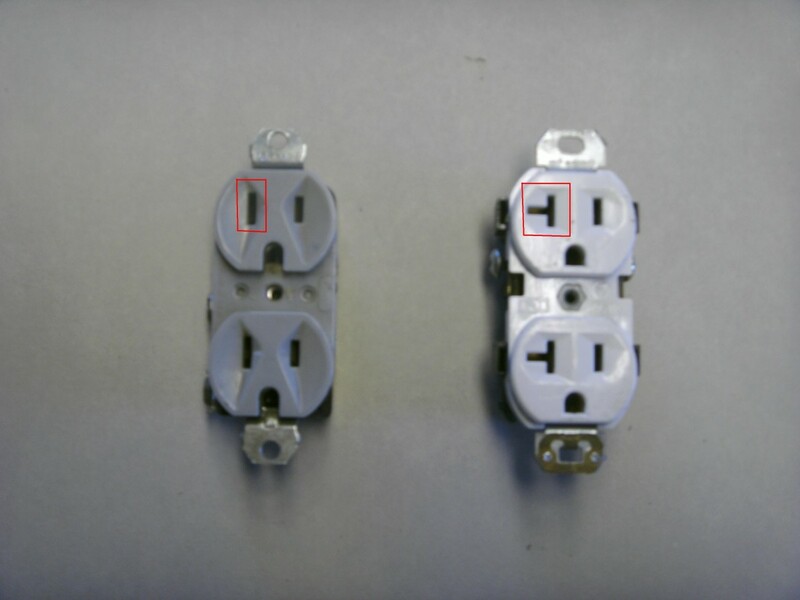 If the existing outlet is in the same stud space, do not remove the existing outlet, but go on to the section on wiring the outlet. If the existing outlet to be used as a power source is outside the same stud space, turn the power off and remove the cover plate. Remove the two screws holding the outlet in the box and, holding the outlet at the top and bottom, pull it from the wall. Check for power with a voltmeter or non-contact voltage detector before proceeding; getting shocked isn't fun and should never be a part of the job. Yes, you turned the power off (or think you did) but that doesn't mean it stayed off or that you actually found the right breaker. As a professional electrician, checking for power before doing any work is just part of the job, and that voltage detector in my pocket gets constant use. After verifying that the power is off, remove the wires from the outlet by either loosening the screws holding them or by inserting a small tool into the spring slot in the back of the outlet if they are simply pushed into holes in the outlet. Make note of any splices in the box where wires are joined with wire nuts and where the wires go on the outlet. Normally, wires will be spliced color-to-same-color and there will be a black wire on the brass-colored screw, a white wire on the white or silver screw and a bare wire on the green screw, but if it is a half-hot switched outlet, this might not be the case. The box is held to an adjacent stud by two nails, one at the top and bottom and just outside the box. Using a hacksaw blade or sawzall, insert the blade between the box and that stud and cut the nails holding the box to the stud. 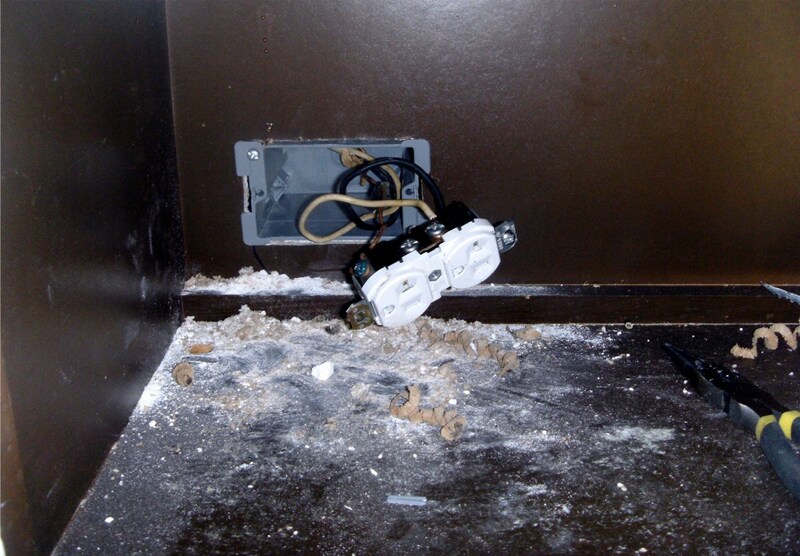 Be very careful not to damage the wires buried in the wall; they will be stapled to the stud just above or below the box. Your saw blade should never go more than about ½" above or below the box as you cut up or down. If you cannot get the nails cut the box can be removed in pieces using a hammer, screwdriver and pliers by breaking it apart, but it is easier to cut those nails. Remove the old box from the wall, feeding the wires back out through the holes they entered through. and pull the box from the wall. A hole must be drilled through the top plate and in the same stud bay the new outlet is in. Very careful measurements need to be taken to find that same stud bay, or a small piece of stiff wire can be driven through the ceiling at the very edge of the wall. If this is done that tiny hole can be filled with a daub of drywall mud or toothpaste. The top plate of the wall will be visible after insulation is scraped away, but you must make sure you are drilling in the same stud bay. If you miss it's not a catastrophe; force some insulation or caulking into the hole and re-drill somewhere else. It happens. Feed the wire down through the drilled hole and, reaching into the outlet hole you cut into the wall, pull out about 2 feet. A helper is extremely nice here. String the wire over the rafters to the other outlet location and repeat the process. Staple the wire to the rafters every other rafter, making absolutely sure that the staple doesn't go through the wire; if you inadvertently drive a staple through the wire, discard the wire and start over. It is not repairable. If the wall is insulated, push a long stiff wire through the insulation and pull it out the outlet hole. A helper is most definitely of great value here; you will probably have to make several tries to get it through the insulation. Once through, bend a loop in the top end. Strip the sheathing from several inches of the Romex cable and cut off two of the wires. Insert the third wire through the loop in the stiff wire and loop it as well. Squeeze both loops as small as possible and tape the entire splice with electrical or other tape. Pull the wire down through the wall. Running the wire through a crawl space is easier than through an attic; the problem is finding the wall as the bottom plate, or 2X4, of the wall won't be visible. While there may be other wires or pipes coming down into the crawl it isn't likely, and locating that wall by measurements may be very difficult. If the floor above is carpeted, one way is to drive a large nail through the floor, right next to the wall. Pull the nail back out and insert a stiff wire about two feet into the hole; it can be seen from below in the crawl and then it is a simple matter to measure over to the center of the wall. Hardwood or vinyl floors may need the baseboard removed to perform the same trick as the hole in the floor will then be hidden under the replaced baseboard. On the plus side, pushing the wire up is easy even in an insulated wall as the outlet will only be only 18" or so above the floor. With the holes drilled into the bottom plate of the wall, push the wire up and pull it out of the wall about 2 feet. Run the wire across the floor joists, stapling it every other joist, and up inside the second wall. Plug any holes drilled with caulking or packed insulation to keep insects from entering the house. If the new and old outlets are in the same stud bay, you can reach inside the hole for the new box and insert the wire into the old box without removing it. Push the wire into one of the unused entry slots at the top or bottom of the old box, pushing about 8" into the box, and leave the other end sticking out of the wall where the new box will be installed. Push both new and any old cables into the slots at the top or bottom of the new box(es). Remove the outer sheath of the cable on all cable in the box, leaving only about ½" of insulated cable inside the box. Remove any paper from the cable. Carefully work the box into the wall and tighten the screws holding it. Cut the wires inside the box to about 6" long and strip ½" of insulation from each wire. The new outlet will have only the three wires (one cable) in the box; the black wire goes to the brass colored screw, the white wire terminates on the silver or white colored screw and the bare wire will go to the green screw near the bottom. It is best to bend the wire into a half circle and put it under the screws rather than pushing it into the holes on the back; the springs in those holes have a way of loosening over the years and often fail to provide a good connection when that happens. Tighten the screws firmly around the wires and fold the wires back into the box. 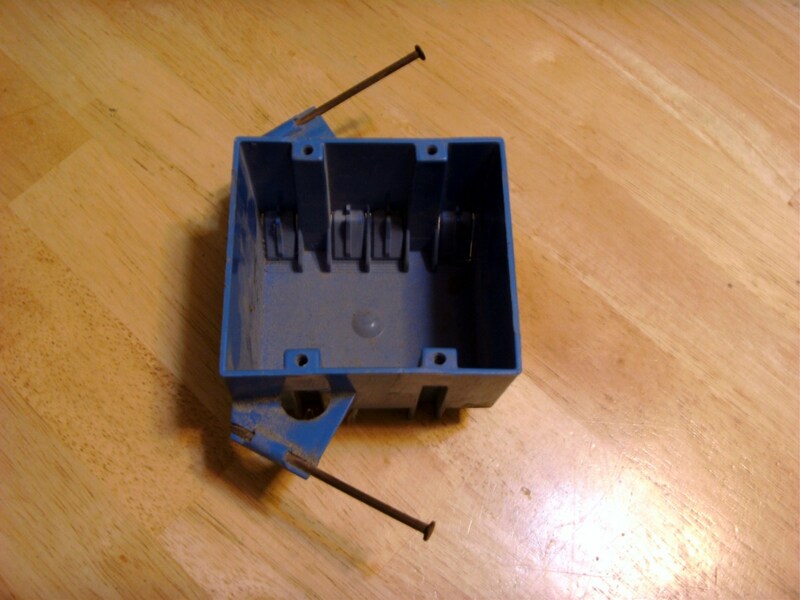 Attach the outlet to the box with the two screws provided and install a new cover plate. The original box will now have an extra cable in it. If there are already two cables in that box (common) the wires will need to be removed from the old outlet if you haven't already done it. Splice all three cables (or however many there are), along with a new 6" piece of wire. Black to black, white to white and bare wire to bare wire. Any other wires (such as a red wire on a switched outlet) splice together or terminate on the old outlet just as they did before. 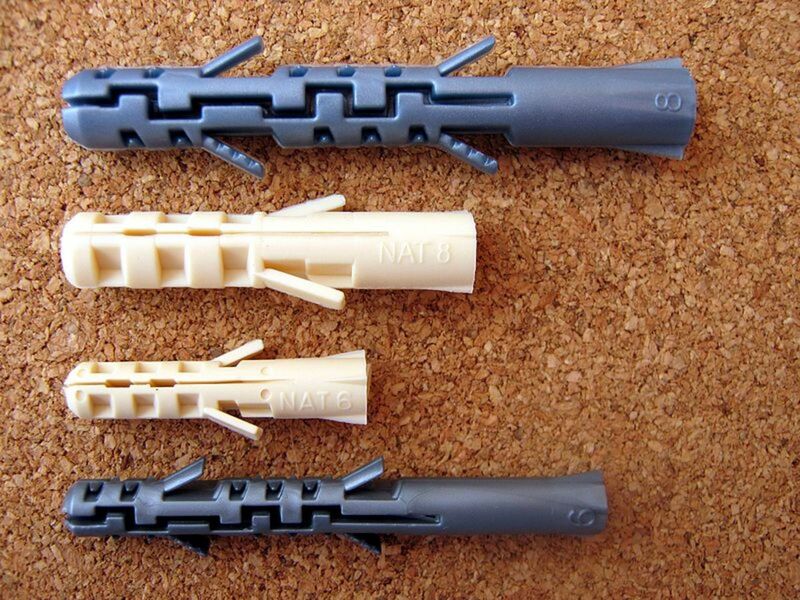 The additional 6" pieces will be used to terminate on the outlet in the same manner as the new outlet already done. 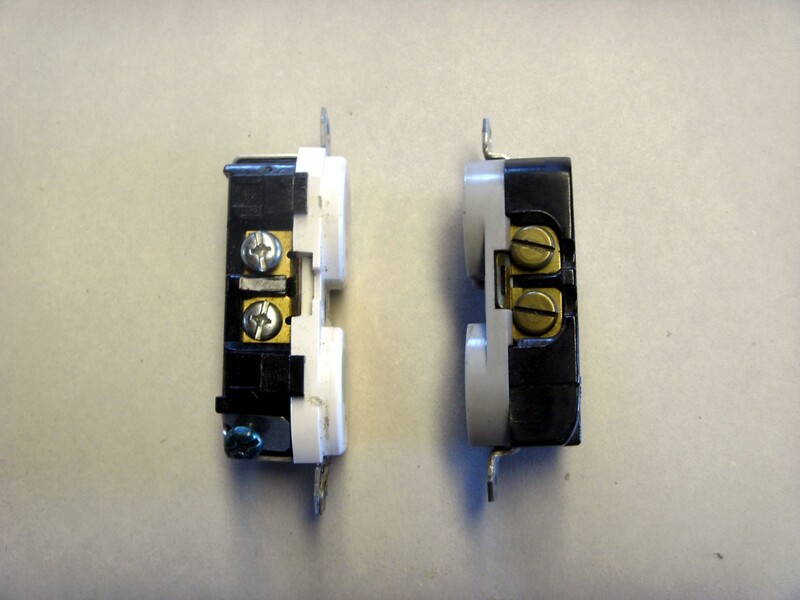 Again, fold the wires into the box and attach the outlet to the box with two screws. Install the cover plate. Turn the breaker back on and test the new outlet for proper operation. You're done! What's next, then? 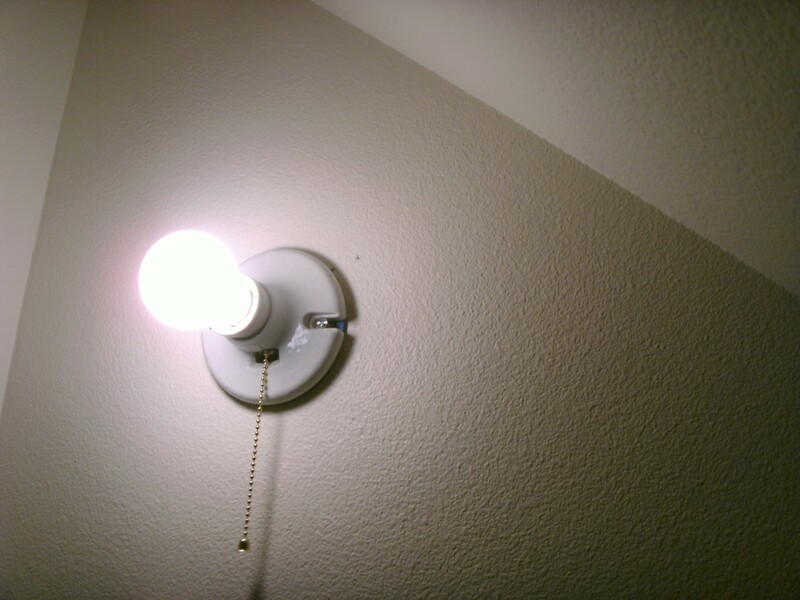 Installing a new light fixture? Or maybe amotion sensor switch in that dark laundry room? Got a 3 way switch that needs replacement? All these and much more is possible to a homeowner willing to work a little around the home rather than hire someone else to come into their home to do it. It can also save more than a little money—that outlet you just installed for $30 or so would probably have cost well over $200 had you hired it done. Sure, Mark. I've seen those outlets with USB ports and am thinking about replacing some of mine with those. They will work just the same. I would also like to know if I can use a different type of outlet..Instead of a normal outlet like you wrote the guide to above, this one has USB ports installed in it. Can I install it with the same method?